Maxim Integrated now offers two new single-chip security supervisors namely the MAX36010 and MAX36011. These security solutions have been designed in such a way that it will be easy for engineers to make use of it in their applications without being a security expert themselves. 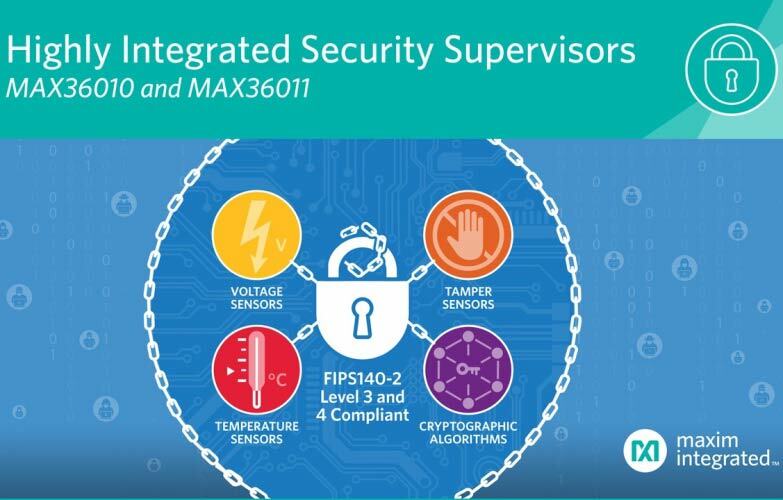 Both MAX36010 and MAX36011 are low-power security supervisors designed for fiscal memory, internet security, and IP protection applications that require certificate-based or other public key cryptography schemes. The devices also incorporate sophisticated security mechanisms to protect sensitive information in secure memory, two pairs of external sensor input, and environmental monitors (temperature and voltage sensors) that erase the secure memory when an attack condition is detected. To ensure a higher level of security, these supervisors generate keys via a true random number generator (TRNG). The keys are then stored in battery-backed RAM along with certificates and other sensitive data. This data is erased when tampering is detected, a capability that meets the requirements of Federal Information Processing Standard (FIPS) Publication 140-2 at its highest security levels (Levels 3 and 4).The MAX36010 and MAX36011 both support symmetric and asymmetric cryptographic functions such as Data Encryption Standard (3DES), Advanced Encryption Standartd (AES), Rivest–Shamir–Adleman (RSA)and Elliptic Curve Digital Signature Algorithm (ECDSA). These secure cryptographic engines are designed and compliant to the requirements of Payment Card Industry (PCI) and FIPS140-2 certifications. The MAX36010 supports symmetric key generation for AES and 3DES, whereas the MAX36011 supports both symmetric and asymmetric key generations for AES, 3DES, RSA and ECDSA. Both MAX36010 and MAX36011 are currently in production and the datasheet for the same can be obtained from maxim website after agreeing for their NDA. You can request for samples and pricing from their authorized distributors. Designers can also make use of the MAX36010EVKIT for evaluation, which is available on Maxim’s website.